Yesterday myself, my father-in-law and cousin-in-law (is there such a thing), ran the Georgetown to Idaho Springs half-marathon. Having been dragged out of bed at 4:30am, so we could drive 2000feet up into the mountains, this southern boy was worried about the effects of altitude (not to mention the 50 degrees temps at the start of the race). I decided only 5 weeks ago to run this half-marathon; and since the doctor had nixed all running for two months after the skin cancer removal, I had to quickly go from 0miles/week to 26miles/week. To accomplish this often meant running at 3pm in Atlanta during late July (meaning 95+ degrees with 70-80% humidity). I figured this would prepare me for running at 8450feet. Thankfully the race dropped 1000ft over the 13miles, so each step down hill I would convince myself that I was getting a few more bits of oxygen. And as the temperatures increased I noticed the Coloradoians bobbing and weaving across the course in order to stay in the shade, which gave me clear running in a pleasently sunny day with temps around 85. Myself and 2053 other runners had an awesome run through the rockie mountains. We passed by rugged mountains, where I kept my eye out for mountain goats or lions rather than the road in front of me. We crossed over a small river where folks where fly fishing and rafting. 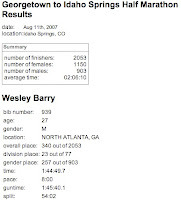 And ultimately ended up in a small mountain town of Idaho Springs, CO.
Nice job – did you run in a trench coat? You know, to keep out of the sun?